1 Now on the first day of the week Mary Mag’dalene came to the tomb early, while it was still dark, and saw that the stone had been taken away from the tomb. 3 Peter then came out with the other disciple, and they went toward the tomb. 4 They both ran, but the other disciple outran Peter and reached the tomb first; 5 and stooping to look in, he saw the linen cloths lying there, but he did not go in. 6 Then Simon Peter came, following him, and went into the tomb; he saw the linen cloths lying, 7 and the napkin, which had been on his head, not lying with the linen cloths but rolled up in a place by itself. 8 Then the other disciple, who reached the tomb first, also went in, and he saw and believed; 9 for as yet they did not know the scripture, that he must rise from the dead. 10 Then the disciples went back to their homes. Easter Sunday Mass is the first of a series of fifty Masses that are celebrated until Pentecost Sunday. The Readings of the Masses on these days help us reflect on the Gospel revelations that took place after the resurrection and the fruits of our redemption won for us by Jesus. The Readings for this Easter Sunday Mass are the same for each of the three Liturgical cycles of A, B and C.
“Now on the first day of the week” — Sunday is the first day of the week. From the moment of the Resurrection of Jesus Sunday takes on a new role and replaces the Sabbath in importance. It becomes the day of rest and worship. “Jesus rose from the dead ‘on the first day of the week.’ Because it is the ‘first day,’ the day of Christ’s Resurrection recalls the first creation. Because it is [also] the ‘eighth day’ following the sabbath, it symbolizes the new creation ushered in by Christ’s Resurrection. For Christians it has become the first of all days, the first of all feasts, the Lord’s Day, Sunday” (Catechism of Catholic Church, 2174). “Mary Mag’dalene came to the tomb early,” — In John’s Gospel Mary Magdalene is mentioned as coming to the tomb alone. The most likely reason for this is that Mary Magdalene appears first in the lists of women who witnessed the death and resurrection of Jesus. She is the woman who best reveals love for Jesus. She will be mentioned alone in verse 11–18 when she meets Jesus. Nevertheless in verse 2, when she meets the apostles she states “we do not know where they have laid him.” She is obviously speaking of going to the apostle with other people. John does not say why Mary Magdalene came to the tomb. The body had already been anointed before the burial according to John: “Nicodemus… came bringing a mixture of myrrh and aloes, about a hundred pounds’ weight. They took the body of Jesus, and bound it in linen cloths with the spices, as is the burial custom of the Jews” (Jn. 19: 39–40). It is not stated that she intended to anoint the body. It is most likely that she went to the tomb out of love and devotion. It was a Jewish custom to visit tombs and graves for three days as it was thought that the spirit of the deceased lingered with the body for a short time. “The tomb” is mentioned seven times in this passage. Obviously the emphasis on “the tomb” is meant to be highlighted to keep our minds focused on it. “while it was still dark” — A theme in John, frequently alluded to, is that darkness represents a lack of faith, the absence of Jesus (Jn. 1: 5; 3: 2; 6: 17; 8: 12; 9: 4; 11: 10; 12: 35; 12: 46; 13: 30; 19: 39). Mary Magdalene lacks faith at this point. She is in the dark. But there is hope, it is “early”, the light is coming; darkness is on the way out. Faith is being offered to her soon and not only to her but to all who are in the dark because of sin, alienation, ignorance and death. “and saw that the stone had been taken away from the tomb” — That the stone had “been taken away from the tomb” is to be understood as moved away. In Greek syntax, without mentioning his name, this is a way of saying that God removed the stone. It is not mentioned that Mary Magdalene entered the tomb or even looked inside. All she saw was that the stone had been rolled back. She investigated no further. She presumed, without a thought of any other possibility, that humans had rolled back the stone to remove the body. What is the significance of the stone being rolled away from the entrance to the tomb? For large numbers of people the stone was rolled away to allow Jesus to exit. That would be an incorrect interpretation. Jesus’ risen body had properties that allowed it to pass through stone, as we know from his entering the closed doors of the Upper Room where the apostles were gathered. The stone was removed from the entrance to the tomb not to permit the resurrection but to indicate that Jesus had risen and left the tomb. If the stone had not been rolled away no one would even guess that Jesus had risen. So she ran” — Mary Magdalene ran because her message was most important and urgent. This indicates how we should be so full of zeal to share the Good News. “and went to Simon Peter and the other disciple, the one whom Jesus loved, and said to them” — She ran to the chief apostle, Peter, to let him know and do what he could. Peter was with the “beloved disciple” and Mary knew this. They had not fled from Jerusalem. There is no mention of the other apostles and we cannot even hazard a guess because there is no clue. This is the first time that these two apostles are linked. For references in John’s Gospel to the Beloved Disciple see Jn. 13: 23–25; 18: 15–16; 19: 25–27; 20: 2; 21: 20. “‘They have taken the Lord out of the tomb” — Mary Magdalene uses the word “Lord” for the first time. This word will be used five other times in this chapter (Jn. 19: 2, 13, 18, 20, 25, 28). Generally the word refers to the resurrected Lord who is divine but as verses 2 and 13 clearly imply a lack of faith in Mary Magdalene, it may have no other meaning here than a title of respect. Mary may have thought that “the Jews” had taken the body of Jesus. For references of the disciples’ fear of “the Jews” see Jn. 19: 31, 38; 20: 19, 26. She may also have suspected that thieves had come and stolen the body, a quite common happening at the time. She will repeat this surmise in verses 13 and 15. She did not even suspect the resurrection. She had absolutely no faith in the resurrection. “and we do not know where they have laid him.” — The word “we” is plural so she may have had other persons with her when she saw the stone rolled away from the entrance. Yet these are not referred to and to presume others would be only surmise. It might also mean that the “we” refers to Peter and the beloved disciple. It brings out the point that at this stage of the story there is confusion and lack of faith by all involved. Peter then came out with the other disciple, and they went toward the tomb” — We are not told from where Peter “came out”. In verse 10 it is said that they returned to their homes, so it is most likely that he came out of the house where he was staying. Precedence is given to Peter; he is clearly in charge and considered as such by others. “They both ran, but the other disciple outran Peter and reached the tomb first” — “The other disciple”, whose name is never given but is normally presumed to have been John the apostle, reached the tomb first. No reason is offered for his speed but traditionally it is presumed that he was younger than Peter or, perhaps, was motivated by greater love for Jesus. “and stooping to look in — He did not go in out of deference and respect for Peter the leader and chief of the apostles. He had to stoop to look in because the entrance to the tomb was at ground level. “he saw the linen cloths lying there, but he did not go in” — He saw the stone rolled back and in addition the “linen cloths”. Nothing else is mentioned. This is his first view of the linen cloths and he does not react with faith this time. Then Simon Peter came, following him, and went into the tomb” — Once again John the author emphasises Peter’s role as head of the apostles with authority. We are being told that the proper witness to the mystery of Christ is Peter with the other apostles. Mary Magdalene was the first to visit the tomb. She saw that the stone had been rolled back but she did not go in. The beloved disciple arrived next at the tomb but he also did not enter. The author, John, clearly wanted to show that the first to enter was Peter. “he saw the linen cloths lying, and the napkin, which had been on his head, not lying with the linen cloths but rolled up in a place by itself” — “The disciple Jesus loved” peered into the tomb and saw only the “linen cloths lying there”. It was for Peter to see “the napkin” which had covered Jesus’ head “rolled up in a place by itself”. This is very strange. One would expect the napkin to be with the linen cloths that had covered the body. The napkin would have been large enough to go under the chin and be tied in a knot above the head. It purpose was to keep the mouth closed. It would have been covered by the linen cloth. The fact that the linen cloths were present was a clear indication that the body of Jesus had not been stolen by robbers or the “Jews” as Mary Magdalene presumed. If people came for the body they would not have removed the cloths. They certainly would not have folded the napkin and put it aside carefully. The oils, particularly myrrh, with which the body had been anointed, acted like glue, making the cloths stick to the body. When separated, force would have to be used and the effects would be obvious. The cloths and napkin were left behind in the tomb because Jesus no longer needed them. These are tools and signs of mortality. Being left in the tomb, they are signs of Jesus risen to a higher life. Once again, as with the stone rolled back from the entrance of the tomb, the special Greek syntax indicates that the napkin had been rolled up by God. There is an important progression in what the three saw: Mary, the stone rolled back; the beloved disciple saw, in addition, the linen cloths; Peter, in addition, saw the napkin. This progress is important as we shall see shortly. We are not told of Peter’s conclusion to what he saw. Then the other disciple, who reached the tomb first, also went in, and he saw and believed” — It is emphasised that “the other disciple” reached the tomb before Peter. He went in and when “he saw” the linen cloths and the napkin rolled apart from the cloths, “he believed”. What did he “believe”? In John’s Gospel ‘seeing and believing’ are often linked — a person sees something such as water at Cana, cures and healings, blood and water gushing from Jesus’ side on the cross, etc. Everyone saw these matters and went no further. Some did have deeper insight; they saw them as signs. John’s Gospel is known as the Gospel of Signs. There are the major seven signs but there are many other diverse signs. This is what the beloved disciple saw — that the empty tomb, the linen cloths and the napkin were signs of something greater. That was his initial faith. It was not strong. It had to grow. We are told that the three witnesses, Mary Magdalene, Peter and the beloved disciples “saw”. A different Greek word is used in each case of seeing. The beloved disciple “saw” twice and on the first occasion the Greek word used is the same as that used for Mary Magdalene. The reason for the use of three words is to indicate a development in seeing that culminates in the faith of the beloved disciple. Mary Magdalene saw nothing other than the stone rolled away from the entrance and so she lacked sufficient facts; her love alone was not sufficient. Peter may have believed but we are not told. The reason is to highlight that what helped bring faith to the “other disciple” was the love that also motivated him to reach the tomb before Peter. His love was what enkindled his faith to recognise the sign. In the Gospels Peter is presented as the man of faith, who first proclaimed that Jesus was the Messiah. He was the one chosen by Jesus to be the head of the apostles, the one with full authority and the one whose role would be to strengthen the faith of the other apostles and disciples. The beloved disciple is presented in the Gospels as the one loved by God to whom from the cross Jesus bequeathed his mother. Peter should not be considered as lacking in love; the beloved disciple as lacking in faith. The verse also teaches that the role of Peter, the chief of the apostles, is to establish facts; the role of the disciples is to accept these facts and believe. “for as yet they did not know the scripture, that he must rise from the dead” — On three recorded occasions Jesus had foretold his passion, death and resurrection. The disciples did not understand; the terms and concepts were ‘unbelievable’ to them. They knew the scriptures but these they did not understand, as is clear from the story in Luke’s Gospel of Jesus instructing the two disciples on the road to Emmaus. The beloved disciple, motivated by love, had a special insight into the linen cloths and the napkin. Others could not have that privilege as they would not witness the empty tomb, the cloths and napkin. Their privilege will be to study the scriptures and develop faith, under the instruction of the Holy Spirit (Jn. 14: 25–26; 16: 12–14). “Then the disciples went back to their homes” — This refers to where they were staying in Jerusalem or its environs, and not to Galilee. 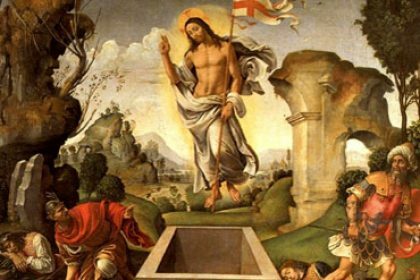 What is the Resurrection? Before we reflect on the Gospel passage it is important to be certain that we understand the meaning of the resurrection. The resurrection is the foundation of our faith. St. Paul wrote to the Corinthians, “if Christ has not been raised, then our proclamation has been in vain and your faith has been in vain. We are even found to be misrepresenting God, because we testified of God that he raised Christ” (I Cor. 15: 13–15). Paul makes two points. First, if Christ has not been raised from the dead, the faith of those who believe this is vain because it is not true. Second, God raised Jesus from the dead and therefore, to deny the resurrection would be to deny what God revealed. As the resurrection is the foundation of our faith, it is so important that we understand what the resurrection is. It is quite easy to roll off words, thinking that we understand the meaning. After experiencing the Transfiguration, Jesus instructed Peter, James and John to keep this knowledge secret from other people until after his resurrection. Among themselves they wondered what “rising from the dead” might mean. There is a lesson there for us. Were Lazarus (Jn. 11: 1–44), the son of the widow of Nain (Lk. 7: 11–17), the daughter of Jairus (Mk. 5: 22–43) resurrected, raised from the dead? Or were they resuscitated? What is the difference? We can agree that they were clinically dead, brought back to full life but they had to die again. They were resuscitated. Thousands were witnesses to Jesus’ physical death by crucifixion, confirmed by the spear that was thrust into his heart. Lazarus came forth with the linen cloth and napkin still around him (Jn. 11: 44); he needed people to take them off. Jesus left his linen cloths and napkin in the tomb because he was rising to a new type of life where he would not need them again; he would not die a second time. The manner in which the linen cloths were placed indicated that he ‘emerged’ without disturbing them. The position of the napkin showed that it had been folded and put aside carefully. These were signs of something ‘strange’. They need interpretation. That interpretation is not given in this Gospel passage but it does gives clues. The resurrection in itself proves that Jesus is the Son of God. He was proclaimed so after his baptism and during the transfiguration. He can say, in the fullest meaning of the words, “I am”. He had prophesied three times that he would suffer, die and rise again. He had made it known that this was to bring salvation to the world, the purpose of his coming. This means that his resurrection is not unique. He made this clear during his earthly life. He was leaving this world to prepare a place for all those who would be willing to follow him. Others can share in his divinity and live with him as partakers of the divine nature. Jesus’ resurrection is our hope of our resurrection. Alleluia! 2. Can we be sure? Most definitely, Yes! With the absolute certainty of faith. This Gospel passage explains. The rolled back stone, the empty tomb, the empty linen cloths and the neatly folded napkin are facts perceptible to the senses. They prove nothing more than that the tomb and cloths were empty. They do not prove the resurrection of Jesus. If there had been a body there then there would be no question of a resurrection. They can be pointers to something greater than themselves. They need fuller meaning. That is the role of sacred scripture with its prophecies and the reports of the various witnesses. Speaking with the two disciples on the road to Emmaus, Jesus said, “O foolish men, and slow of heart to believe all that the prophets had spoken! Was it not necessary that the Christ should suffer these things and enter into his glory? And beginning with Moses and all the prophets, he interpreted to them in all the scriptures the things concerning himself” (Lk. 24: 25–27). From the scriptures we learn of the testimony of the angels who spoke to people at the tomb. There is also what Jesus did and said in the presence of his apostles and disciples in his encounters with them after the discovery of the empty tomb. All these, taken together, manifest the resurrection perfectly, according to St. Thomas Aquinas (III, 55, 6 @1). But they require the gift of faith because they are more than historical facts; they are supernatural realities. St. Peter Chrysologus has a beautiful way of expressing this same truth, “To behold the resurrection, the stone must first be rolled away from our hearts”. 3 Mary, Jesus’ mother: Some have found it strange that Mary, the mother of Jesus, who stood at the foot of the cross, as did Mary Magdalene, did not go to the tomb on the first day of the week with the Magdalene. It has also been said that it is extraordinary that Jesus did not appear to his mother. Some argue that John had taken Mary to his home after Jesus bequeathed her to him while she stood at the foot of the cross. If that is so, then she would have been in the house when Mary Magdalene came to find Peter and the beloved disciple, if he was John the Evangelist and apostle. This is something we are not sure about so Jesus’ mother may have been in another house. Some like to say that Jesus did appear to her but it is not recorded. They add that when Peter and the beloved disciple ran to see the empty tomb, Jesus was with his mother. Very devotional but no grounds of fact! This is not recorded anywhere in the scriptures and so is mere surmise. Mary’s great role in the Bible is to reflect and treasure the word of God. That is how she is shown as the greatest of believes; how her son, Jesus praises her. The sacred scriptures and tradition are our sources of knowledge of what happened. They do not tell us what is not important for our faith. In our Gospel passage we are told that the disciples who went to the tomb did not have full faith in the resurrection because “as yet they did not know the scripture, that he must rise from the dead”. The disciples, and ourselves, have to become like Mary and reflect and treasure the scriptures that inform us about the resurrection and our faith in general.